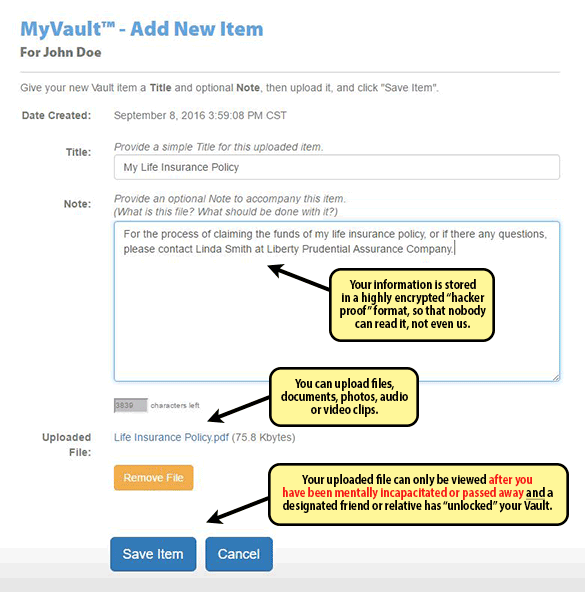 Our MyVault™ service allows you to upload important digital files to our secure, encrypted servers. Using the proprietary MyKeyholders™ service, you can then grant access to your vault after you have passed away. This means that you can get these digital assets into the right hands, at the right time, and not before. The above image shows a sample of a file being uploaded to the MyVault™ service. You create a title, and an explanatory note. You then upload the file. Any digital file that can reside on your computer can be uploaded to your vault, including: documents, photos, audio files and photos. Once you have filled your vault, you can set up access privileges through the MyKeyholders™ service.